Hello Cho Oyu and Shishapangma team members. We just returned from Everest. 14 members and 14 sherpas from our team made the summit in all safety. It was a great group of men and women from around the world. Congratulations to them and thanks to all of the family, sponsors and friends who helped. We also continued our project to rebuild the Deboche Convent, housing 20 Tibetan and Nepalese nuns. Big news: After being closed this spring, Tibet is open again for tourists and climbers. We are now accepting applications and payment for our September-October climbs and treks to Cho-Oyu and Shishapangma, two of Tibet's highest mountains, just near Everest. 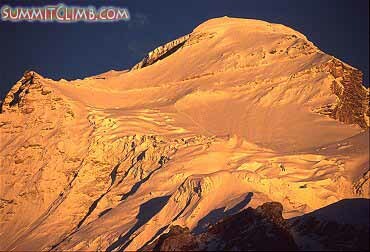 Cho Oyu at sunset. Our team at ABC on Shishapangma leaving for camp 1 (Dan Mazur). I will be leading our teams in Tibet this Autumn. Would you like to join me? Welcome to the team! We have a Cho Oyu expedition twice each year, once in April-May, and again in September-October. It takes a little more than a month to climb Cho Oyu, the sixth highest mountain in the world, and what is considered to be the most accessible of our world's fourteen 8000 metre mountains. Cho Oyu is very high, but not so difficult. It is basically a non-technical snow climb, except for one 5 metre ice step, and another 3 metre rock step. Ropes are fixed on these. The leader is Dan Mazur who has led expeditions to, and reached the summit of Cho Oyu, Everest, K2, etcetera. 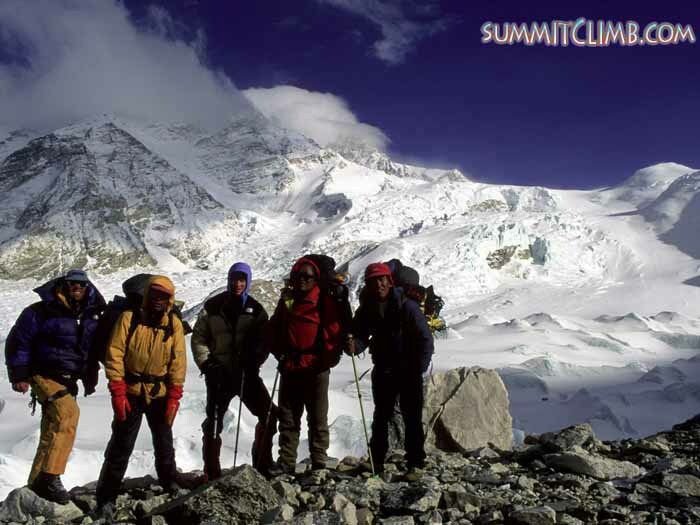 From the summit of Cho Oyu, you can gaze at Everest, Pumori, and the entire Khumbu Valley. A big benefit of our Cho Oyu expedition is the opportunity to travel through exotic Tibet and experience the medieval conditions of this out of the way corner of the Himalaya. Climbing Cho Oyu qualifes you for Everest. Here is the Cho Oyu website with a NEW SLIDESHOW. If you wish to climb in the Autumn, you can also combine it with our Shishapangma climb and could earn a 20 percent discount. The leader of our Shishapangma expedition is Dan Mazur. We provide Sherpas for the group, but you may also wish to have your own private-personal Sherpa. About 1/2 of our members use oxygen, and we have a 50% buy-back policy. Last year's expedition to Cho-Oyu was a success and here is the news. Interested in our Shishapangma climb? The leader is Dan Mazur who has led expeditions to and summitted Shishapangma, Cho Oyu, Everest, and K2. Shishapangma is a fascinating climb, with a mixture of snow climbing and a challenging but not overly difficult but exciting summit day to the central summit. I only climbed to the central summit, as the true summit was another two-six hours above 8000 metres along a twisting double-corniced ridge for a gain of only a few metres! This year, if enough people are interested we plan to climb it via the direct route to the true summit after acclimating on Cho Oyu. This is the most elegant way to climb Shish and a directissima to the rarely ascended true summit. You can combine Shisha with our Cho Oyu climb and earn a 20 percent discount. Here is the site which includes a NEW SLIDESHOW. Please keep the questions coming. For easy and rapid help, take a look at the specific questions and answers section on our website. We have been working a lot on these "q & a" sections, so please tell us if they have been of help, or how we could make them better. Thank you very much. I await your reply, wish you all of the best, and look forward to making your trip a success. Ps. If you know of anyone who would like to become an Himalayan leader, please let us know. Overall expedition success: 14 men and woman members of all ages from around the world and 14 top-quality sherpas on the summit of Mount Everest with no serious accidents. A charitable service project: rebuilding the Deboche Nunnery, installing new roofs, new walls, new kitchen, new toilets and new windows, in a convent inhabited by 20 women from Nepal and Tibet, working together with the Mount Everest Foundation. An exciting trek to basecamp was enjoyed by 12 members, with everyone reaching camp, climbing the beautiful vista-ridge of 'Kala Patar', and 5 members also climbing the fun-easy peak known as 'Island Peak'. The largest-ever family group on the summit: a father and his three children. The youngest Canadian man and woman on the summit, ages 19 and 20. The first Greek and first Dutch persons on the summit. For more information, we welcome you to visit: 'recent news'. Thank you very much.